​They are small and mottled brown in colour with small black spots across forewings. They have a wingspan of 9-16mm. Both the forewings and hindwings have a hairy fringe, making identification of this type of moth slightly easier. Their larvae leave behind cases in which they reside. So if you notice small, rice like cases then it's a tell-tale sign of case-bearing carpet moths. Case-bearing carpet moths (Tinea Pellionella) are a common textile pest, their larvae feed on keratin in natural fibres and so are a household pest due to the damage they can cause to woollen carpets and silk rugs as well as expensive clothing. The larvae can also feed on cobwebs, birds’ nests and other natural materials. Carpet moths are typically found in warmer climates during the summer and late autumn months. So, in the UK’s case this will be from June – September; however, with advancements in central heating, case-bearing carpet moths that live in human dwellings can be seen all year-round, taking the seasonality out of their cycle. After mating, the female will lay her eggs, roughly 40-50 over a course of 4-7 days. The eggs will then hatch into the destructive larvae stage of the life cycle which feeds on, carpet, clothes and other household goods. Typically they are 1-1.5 cm in length, however this is totally dependent on the availability of food and water. Carpet moth larvae can stay at this stage for up to 3 months waiting for favourable conditions so they can pupate and turn into adult moths. When the conditions are right and they’ve reach their optimum size, they then start the pupation stage. They spin a cocoon in which they metamorphose into the adult stage of the life cycle, this can take as little as 9 days and up to 19. Debris from this process may be found scattered around the home in the form of cases that look like small grains of rice. 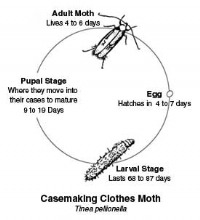 The final stage of the life cycle is obviously the adult moth, whose only purpose is to reproduce - they mate, lay their eggs and then die within 4-6 days. 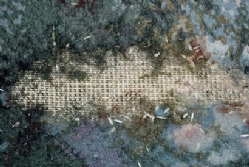 The tell-tale sign of carpet moths is threadbare patches in your carpet. Commonly, carpet moths lay their eggs in dark places, so check around the edges of the room, corners of skirting boards, under furniture etc for damage as well as discarded larval cases. Carpet moth infestations can sometimes originate from bird’s nests, so when trying to identify the source of the infestation it’s useful to check any unused chimneys or attics. 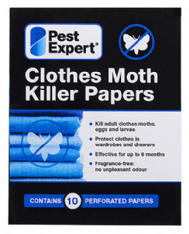 Treating an infestation of carpet moths can be relatively simple. 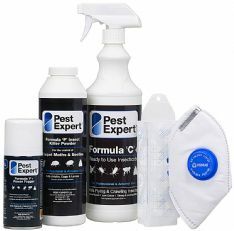 Highly effective DIY carpet moth treatment includes the application of residual moth-killing insecticides such as Formula 'C' Carpet Moth Spray and Formula 'P' Carpet Moth Powder, which kill moths, eggs and larvae. It’s advisable to use these products liberally around the edges of carpets, under long-standing furniture and in other areas of damage. 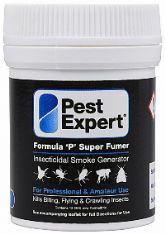 Fumigating with Formula 'P' Foggers will also kill any adult carpet moths at higher levels. Once your initial carpet moth infestation has been eradicated good housekeeping, such as thorough vacuuming can help to prevent the problem recurring. 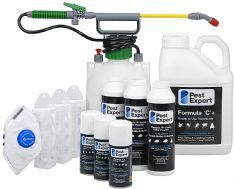 Our Carpet Moth Killer Kits contain everything you need to eliminate a carpet moth infestation in one room quickly and easily. 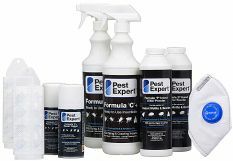 The comprehensive range of carefully selected products will get rid of carpet moths fast and provide ongoing carpet moth control for up to 12 weeks, preventing further damage to your carpets and rugs! 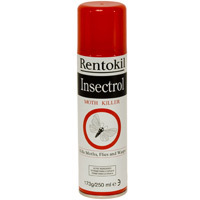 The professional-grade insecticides in our Kits are HSE-approved for amateur use, making them the most powerful available to the DIY user, delivering unbeatable results. 1. 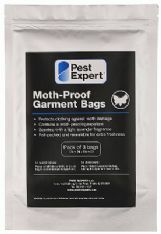 Take children and/or pets out of the room prior to beginning the carpet moth treatment. 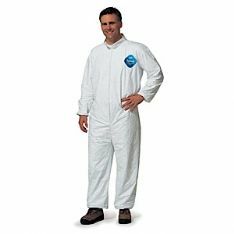 Cover or remove any fish tanks. 3. 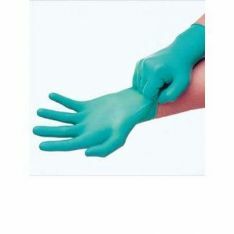 Once the powder has been removed, apply Formula 'C' to affected areas or the entire carpet if activity is widespread. Move any heavy furniture and spray beneath. A heavier application of spray should also be administered around the edges of the room (up to 50cm out from skirting boards/wall-floor junctions). This should save you the trouble of having to lift and treat beneath the edges of the carpet. 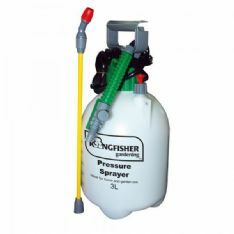 A 1 litre container will treat approx 20 sq m.